As a result of her remarkable regular season, she has been crowned the 2016-17 Ohio Valley Conference Player of the Year. The first sign of Banks proving the hard work paid off was five games into the season at Arkansas-Pine Bluff, November 21st. She posted a career-high 34 points on 15-of-18 shooting to go along with 11 rebounds – a breakout performance which opened eyes around the conference. Leading up to OVC play, Banks had three double-doubles and three 20-point games, with a milestone game against Western Kentucky in between. Against the Hilltoppers on December 3rd, Banks reached the 1,000-point mark for her career, and days later claimed her first-ever OVC Player of the Week honor. She then opened league action with another double-double versus Morehead State, recording efficient shooting displays to help climb the national charts in field goal percentage. Banks’ play was elevated even further against rival Murray State, totaling 23 points and 12 rebounds – the start of a historic seven-game run. She grabbed a second OVC weekly honor following the victory over the Racers, and carried the momentum over to have 27 and 24 points, respectively, against UT Martin and Southeast Missouri. Her finest week statistically came at the start of February, averaging 29 points for the week while doing something only one other APSU player has done in program history. 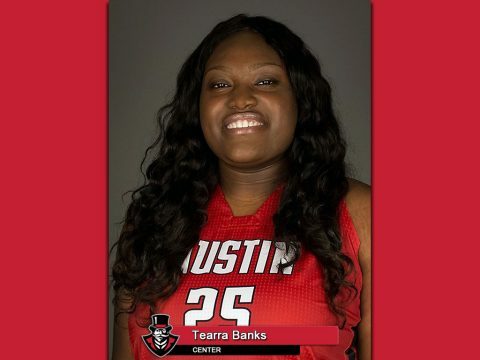 Banks made all 11 of her shots taken in the Tennessee State game, February 4th, going 11-for-11 to match Gerlonda Hardin’s single-game record. This led to her third OVC Player of the Week award. The Louisville native backed that up with a 31-point showing at Murray State, then scored 25 points with 11 rebounds at SIU Edwardsville, February 25th. This extended her streak to seven games with 20 or more points – the first time any Gov has accomplished the feat. 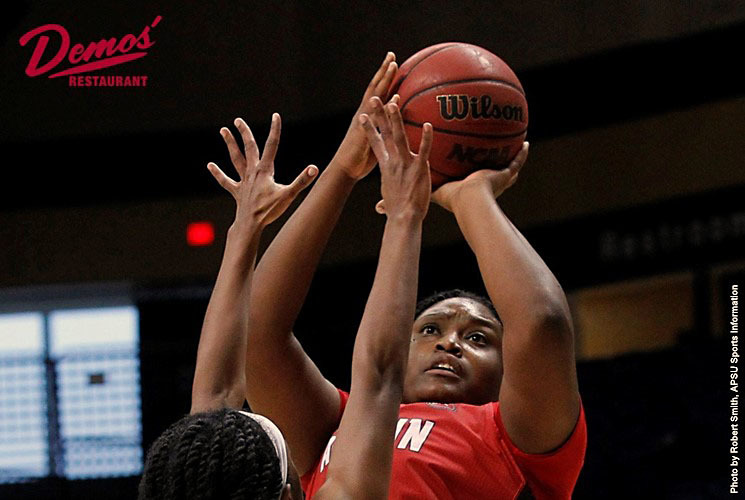 In the regular season finale at Southeast Missouri, last Saturday, Banks stepped up once again to send APSU to the OVC Tournament – recording her season’s 10th double-double (21 points, 13 rebounds). She enters Thursday’s first-round matchup ranked eighth all-time in scoring (1,422 points), sixth in field goals (588), and tied for 10th in blocked shots (58). Banks becomes the third Austin Peay student-athlete to win OVC Player of the Year, joining Brooke Armistead and Gerlonda Hardin who did in back-to-back years beginning in 2002.